One of the issues with the Electronic Logging Device (ELD) mandate that carriers are grappling with is, “How does this impact my drivers?” With several exceptions, one of which is driver-based and several of which are vehicle-based, it is getting confusing for some carriers. Here is a graphic that you can use to make the determination if a driver will need to be using an electronic log, either an automatic onboard recording device (AOBRD) or an Electronic Logging Device (ELD) on December 18, 2017. 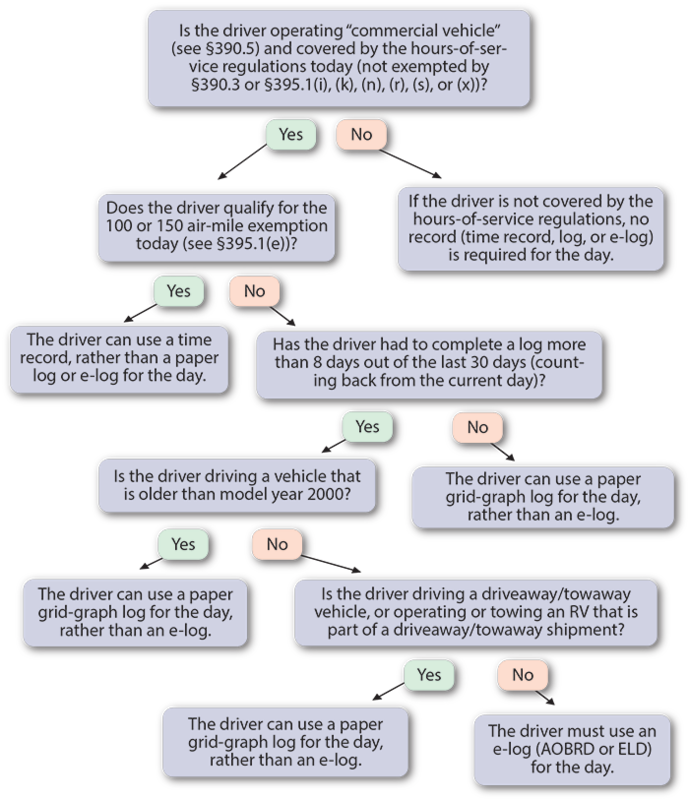 After you use this flowchart enough days for the driver (as in at least eight days), you will be able to determine if the driver is one that will be covered by the ELD mandate. If the driver is required to have an ELD, and is not operating one of the vehicles that is discussed in the exceptions, then whatever vehicle the driver is driving will have to have an e-log in it by December 18, 2017.